This remote control (RC) aircraft carrier measures about 1.5 feet long and has amazing detail. Comes with high grade motors that provide plenty of maneuverability and speed for army and navy boat lovers of all ages. Remote control battleship aircraft carriers are fun for all ages and are a big hit with military personnel too. Check out the realistic rockets, battle gun, and more that are featured on the RC ship. Patrol the waters of your pool, pond, or lake with the remote control aircraft carrier. Radio transmitter is included and the boat comes assembled. Still want more? Ok, order today and we will include a rechargeable battery pack, charger, and 9 volt battery for the remote control! 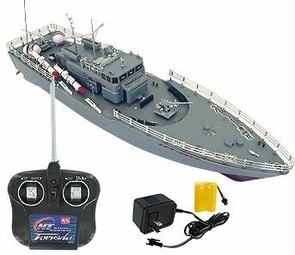 Order 2 of these RC boats and get separate frequencies for the remote controls for dual RC warship battle boat racing fun. Its nice and smooth it takes a little while to charge but fun to drive. Great RC boat thank you. So amazing that it has a helicopter on it!